Introduction: The Czech nobility enjoyed a very strong position in society at the beginning of the 14th century, thanks to a long tradition of gathering (assemblies) and a first crisis which began after the death of Přesmysl Ottokar II (1278). The young, new King of Bohemia, Wenceslas II (1278-1305), was immediately abducted by the regent Otto V of Bavaria (1267-1298). In response, the Bohemian magnates entered the scene, negotiating with Otto about his release and taking responsibility for administering the country in his absence. By the time Wenceslas finally returned to Prague in 1283, the nobility had been able to establish itself both outside (when negotiating with Otto) and inside (within the Czech lands) as the real political representative of the people and the country. Above all, its relationship with the sovereign had been irrevocably transformed. The Czech nobility managed to consolidate its new position because of the succession crisis (the interregnum of 1306-1310) following the death of Wenceslas III, murdered without descent, which entailed the extinction of the Přemyslid dynasty. After the short reign of Rudolf of Habsburg, Henry of Carinthia failed to impose himself as the legitimated ruler. As a consequence, the barons worked with the main abbots of the country to find a solution. 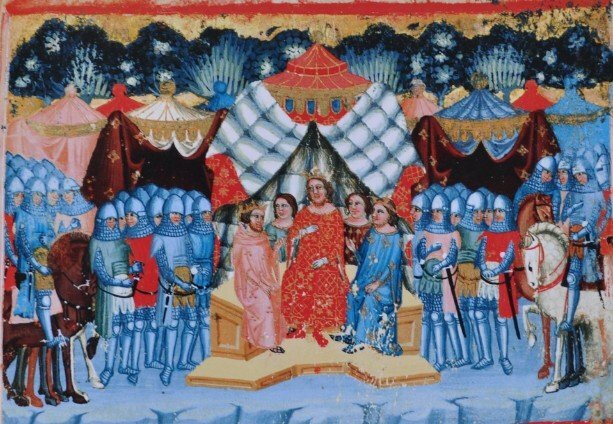 They negotiated with the recently elected King of the Romans, Henry of Luxembourg (1308-1313), and decided to arrange a marriage for his young son John with the Přemyslid princess Elizabeth and elect him as King of Bohemia (1310). In exchange, John gave his promise to respect the local customs and liberties (Inaugural diplomas).